17 December 2007 was the day taxi fares raised between 10-49% in Singapore. People started to avoid taking taxis and taxis were abundant. There were queues of empty taxis waiting in line at all the taxi stands. Well, I guess the locals have gone back to their old habits and have reverted to taking taxis again. Just look at the queue as seen yesterday at the IT Show. How much does taxi cares cost in your city? 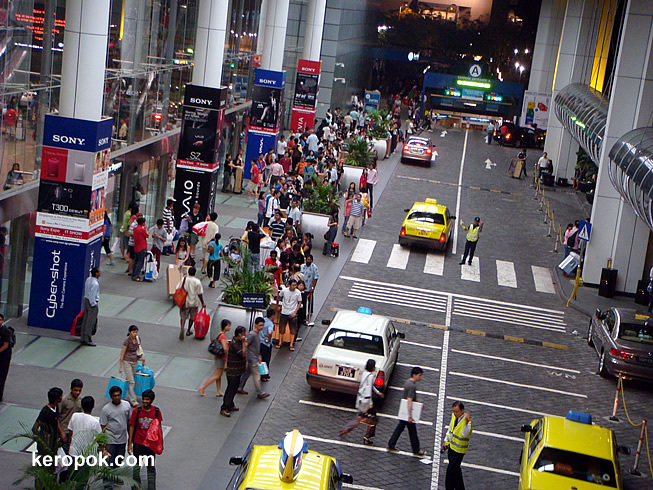 Click here if you wish to know the prices of cab fares in Singapore. A taxi from town to my house costs about £7,which is'nt too bad. Its funny how people soon forget about things that annoy them and go back to their old ways! Hahaha, make sense to take taxi with all the big shopping bags and boxes at IT show. They wont have a chance to squeeze in the already crowded MRT train. Have a nice day. Hello from New York! Love your pictures. Very nice work. I am keropok manufacturer at Terengganu.. Anyone or company from Singapore wanna do keropok business with me?